Fall has officially started and we are ready for the comfort foods the season change brings! Nothing feels more like fall than apple picking, caramel apples & apple pie (in moderation! ), apple cider, applesauce ... noticing a theme here ;) Today we are taking advantage and whipping up our comforting dish of honey pork chops topped with homemade applesauce! This dish is super simple but tastes so good you'll think it cooked all day making it perfect for fall dinner parties. 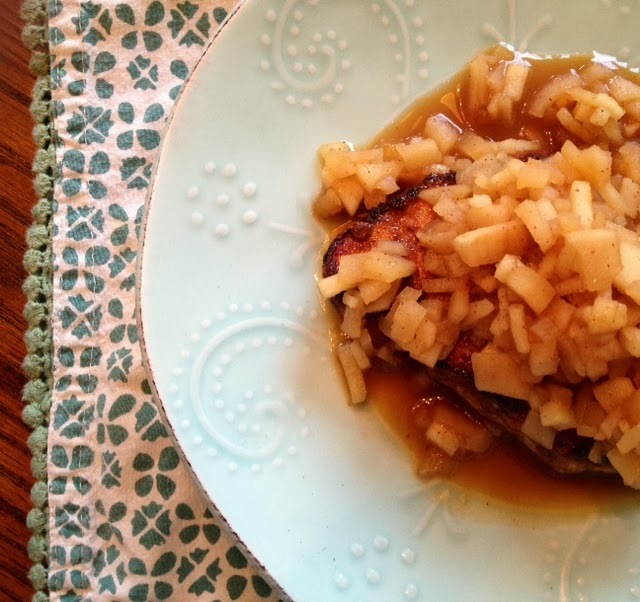 We start by brushing our boneless pork chops with a touch of organic honey for sweetness. Our apple sauce is a tasty combination of chopped apples browned in a teaspoon of butter. We season them with cinnamon, a touch of brown sugar and simmer them up in fresh apple cider until the sauce is warm & cooked through. Hope you enjoy this fresh fall meal! 1. Remove any visible fat from your chops & brush them with honey. 2. Heat saute pan to medium-high heat and add olive oil. Add chops to pan & cook 4-5 minutes on each side until cooked through. 3. Peel apples and dice fruit into small pieces. 4. In separate saute pan, add butter and chopped apples - cook 2-3 minutes until softened. 5. Season with brown sugar & cinnamon and stir to combine. 6. Add apple cider to apples and simmer for 5-6 minutes to allow flavors to combine and sauce to reduce. 7. 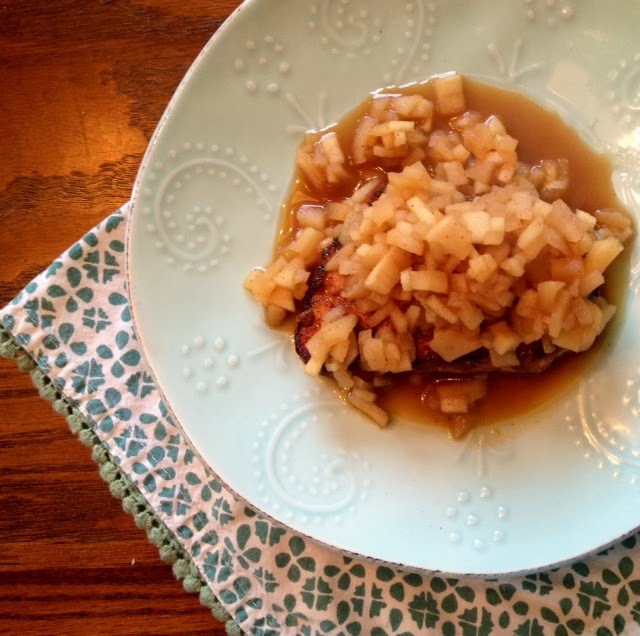 Dish up chops and top each one with 1/4 of your applesauce. Yum! This is SO perfect for the fall. that looks so delicious! I will definitely try this!